For effective PZP contraception, the initial treatment of each species should be consistent with its seasonal pattern of reproduction. For species with an extremely well defined and short (2-3 months or less) breeding season, a minimum of two inoculations should be given during the first year of treatment. The first inoculation (primer) must be given 1-2 months prior to breeding activity and the second inoculation 2-6 weeks later but no later than 1-2 weeks prior to the onset of breeding activity. In species with a significantly longer breeding season, or where the vaccine is given at a time other than just prior to the breeding season, the first inoculation should be given on day 0, the second on day 21 and in cases where contraception is absolutely vital, a third inoculation should be given on day 45. Until data are obtained that suggest otherwise, single annual booster inoculations may be given during subsequent years in some species. In year-round breeders, evidence indicates that booster inoculations should be given every seven to eight months (see Frank et al. 2005). The standard dose of PZP antigen for animals is 100 µg of protein in phosphate buffered saline or sterile water. 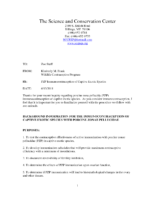 This dose may be adjusted downward for some species and will be determined prior to administration. If you are interested in starting a non-captive wildlife project please contact the SCC. There may be agencies in your state or country that need to be contacted before starting a fertility control project. 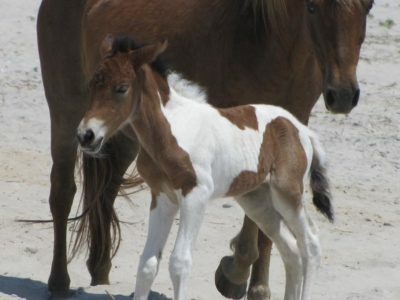 This foal is on Assateague Island National Seashore. The NPS has managed the wild horse population with PZP immunocontraception since 1995. Every mare gets to make her genetic contribution……..isn’t this one adorable!